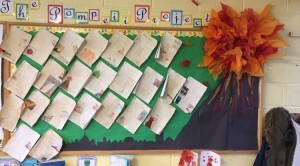 Home Curriculum 5th Class Pompeii Project! In our first term, we studied Pompeii and its infamous volcanic mountain, Mount Vesuvius. Combining five curricular areas, we created a project on Pompeii, named ‘The Pompeii Project’. As part of this project, we each created a newspaper entitled ‘The Pompeii Times’ and wrote detailed articles based on the events of the volcanic eruption in AD79. Through the use of History, we studied the background of Pompeii and the details of the deadly eruption to enable us to write detailed accounts of what happened in AD79. In Geography, we investigated the causes and effects of volcanic eruptions in order to be able to explain to our readers why Mount Vesuvius’ eruption was so forceful. Using out Report Writing techniques in English, we combined our knowledge from our History and Geogrpahy investigations and wrote detailed articles, giving eye-witness accounts and informing our readers why a volcanic eruption such as that of Mount Vesuvius took place. Using our artistic skills we dyed our paper with tea-bags and illustrated our newspapers to give our project a realistic look. Lastly, through the medium of drama, we acted out a TV news bulletin which included interviews with locals, Mayors, and world leaders giving their descriptions and opinions on the eruption.